Mid February, right around V-day, we spent a little time giving love to ourselves by trying a new workout. 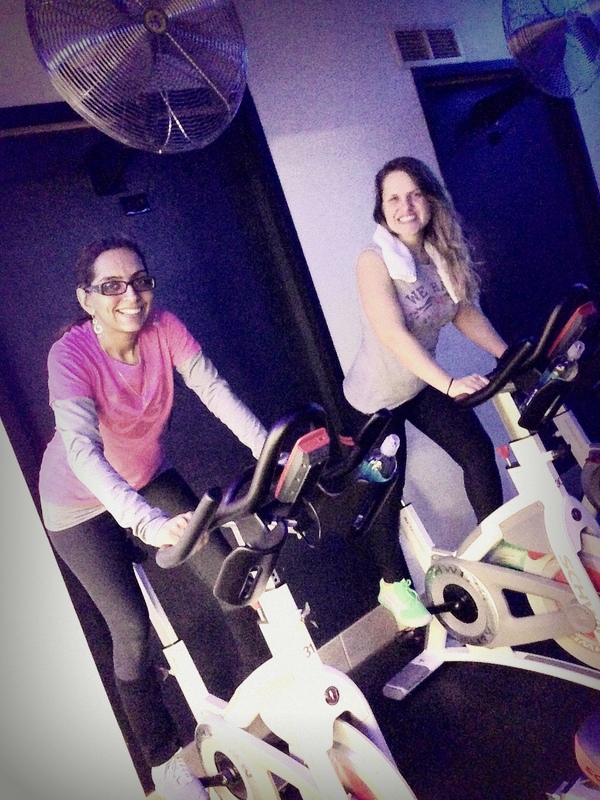 Kate has always been a little hesitant about indoor cycling, a.k.a spinning, while Monica was fascinated with this high-energy fitness style. 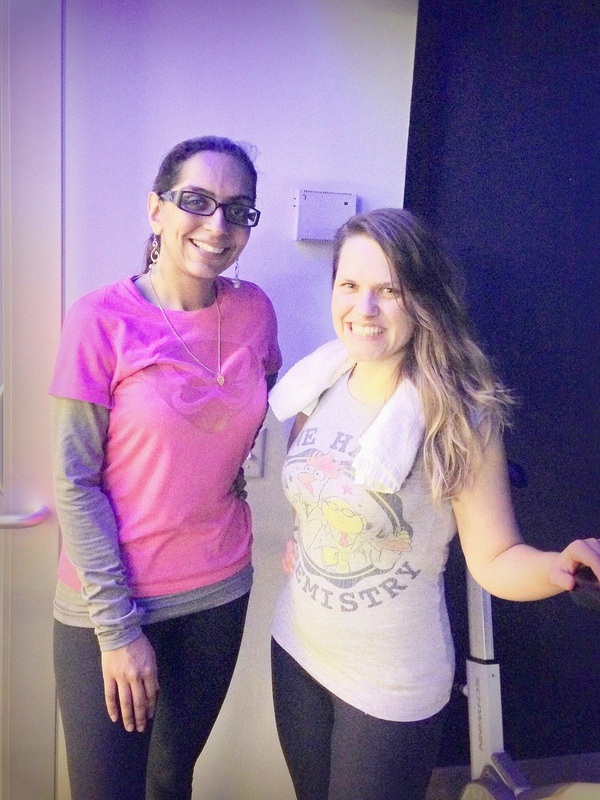 We picked the perfect opportunity to jump in and test the spin cycle when Cheeky Chicago planned a Valentine’s studio cycling event with Equinox Lincoln Park. We made it to class just in time to get on our bikes and chose the back row to avoid the front row spotlight. Big tip: If it’s your first time, flag the instructor down to help you adjust your bike and show you the how to work the darn thing. Bike seats and handles are adjustable and move up/down, forward/back….very helpful for the vertically gifted or challenged. Kate’s bike seat was not quite locked and took a dip midway through cycling which was very unexpected and uncomfortable indeed. The tools that you use throughout your ride include a red knob to up or lower the resistance of your bike and increase intensity in addition to a screen to track your rpm and mileage. And the one thing we were wondering throughout about cycling…is it possible to get a more comfy plushy seat? The instructor started us off with a warm up of moderate pedaling and then led the class in an interval format as bubbly pop music played in the background. She was unashamed to throw Beiber and Usher in the mix to get us moving. After we were slightly sweaty, the resistance was added and we worked in a hill format. We both popped up off the bike seats and pedaled while standing, making it a killer quad and glute experience. After pedaling full steam ahead for 45 minutes, we were treated to KIND bars and Juice Rx Gingerade (lemon, ginger and Vermont maple syrup) as other guests learned foam rolling tips from Equinox trainers. We also scored one week passes to Equinox for ourselves and our readers. Comment below to receive a one week pass! Lincoln Park Equinox has creative variations of Studio Cycling, Barre classes, Tabata and not to be missed Yoga with Allison English! For the March schedule, click here. Feel like spinning your wheels a little more for a good cause? Get your spin on to help stop violence in Chicago. Ride Spin to Break the Cycle on March 8th at the House of Blues for 1, 2, or 3 hours!